What is a Municipal Grant? 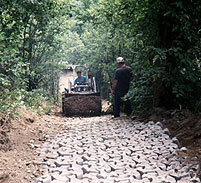 A grant available to municipalities for sharing the cost of ATV trail development and maintenance. It differs from a club grant in that a town, city or county must submit the request and local matching money must be present. Some of these forms are downloadable PDF documents. You will need the free Acrobat Reader to view them. How does a municipality apply? Request the necessary forms from the Bureau of Parks and Lands, ATV Program (or download them from this site), complete them as required, have them signed by the appropriate municipal official, and forward them to the Bureau. Yes. The deadline for applying is May 30. How long must a municipality participate in this program? A one year commitment must be made. There is no specific long range commitment, but continued participation should be considered in the initial planning process. In the event a project calls for considerable development expenditure, the continued operation of the project would be a factor in approval. How does a municipality determine anticipated expenses when preparing an application? If the trails have been previously maintained, review club records; check with an adjacent community that is participating in the program; or request assistance from the ATV Program. Does the town have to do the work themselves? No. The town may contract with an individual, an organization, or an ATV club to do the work. Is it necessary for a municipal official to be the project director? No. The town can appoint anyone to be the project director. Representatives of local ATV clubs are often appointed. The State provides up to 70% of the cost of an approved project. No. The method by which the local share is raised is solely up to the municipality. What type of expense is eligible for reimbursement under this grant? Most trail development or improvement costs such as gas, oil, equipment rental, equipment repair, bridge material, or reasonable contract costs, if the work is contracted. Can capital equipment such as ATVs and major equipment be purchased through this grant? No. Capital equipment purchases are not a reimbursable expense: however, reasonable hourly or seasonal rental fees can be charged. Reasonable charges will depend on the type of equipment used and whether operating costs are charged. No. This is a reimbursement program. Local money must be spent before state money is made available. What is the procedure to follow when requesting reimbursement of expended money? An appropriate reimbursement request form must be submitted with worksheets and receipts explaining expenditures. These can be submitted monthly or at the end of the season. All requests must be postmarked on or before Nov. 30th of the request year. Can an ATV club apply for this grant? Clubs must work through their municipal officials or county officials, who must submit the application. What type of trail qualifies for this grant? Presently, all trails that meet the desired guidelines qualify for a grant. Grant requests for main artery trails are encouraged. Yes. The Bureau requires 7 1/2 or 15 minute series topographical map or a map of at least similar quality and scale. Yes. Written permission or written verification of verbal permission from landowners is required. The proposal must also include DEP or LUPC permits where required. How does the State ensure that work is performed according to the project description? Through consultation with the Project Director and periodic field inspections by a representative of the ATV Program.